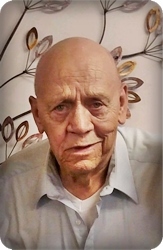 On Wednesday, March 20, 2019, LeRoy David Marshall, age 78, of Kentwood, passed away at his home surrounded by his family. LeRoy worked for G.M. for 32 years. He loved John Wayne westerns, action movies, Big Time Wrestling and classic country music. He will be deeply missed by his children, Jane (Ed) Johnson, Sue Marshall, Connie Marshall-Haan; grandchildren, Robert Lee Schumaker, Fred (Samantha) Petersen, Katelynn (Drew) Petersen, David Haan, Shane Marshall, Patricia Haan, Taylor Barnes, Dustin (Chrissy) Johnson, Sara (Jeff) Johnson, Graham (Corinna) Johnson; seven great grandchildren; brothers, Marvin Marshall and Ralph Marshall. His wife, Patricia J. Marshall, and son, Arnold D. Marshall, preceded him in death. The family will greet visitors on Friday, March 22 from 2 - 4 and 6 - 8 pm and Saturday, March 23 from 1 - 2 pm at Stroo Funeral Home where the funeral will begin at 2 pm. Pastor David Struyk will officiate. Interment will be in Chapel Hill Memorial Gardens.